Can you can spot which streaks are Orion? 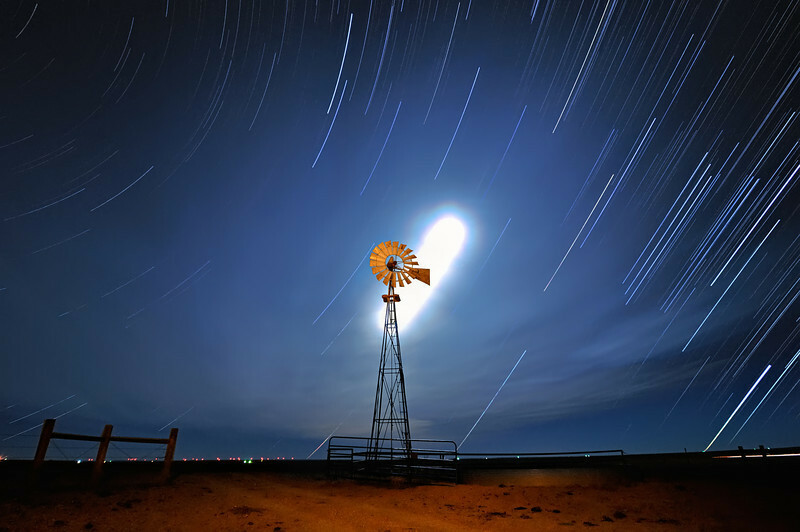 The moon arcs across a Pawnee National Grassland sky in NE Colorado with an iconic Aermotor windmill in the foreground. The red lights in the distance are from a modern wind farm (Cedar Creek). Shot Notes: This was an involved process: A. In the field I took 467 shots to create this image: 466 8 second shots for the trails and 1 shot with a handheld SB800 flash with CTO warming gell to light up the windmill/foreground; B. Batch convert RAW images to 16 bit TIFFs in the ever-living slow Nikon Capture NX2; C: Batch stack the 466 TIFFs with the startrails action in Photoshop; D: Clone out unwanted lens flair and tidy up resulting image with NR, other basic edits; E: Prepare image with warming flash used to help pop the foreground/windmill; F: Blend star/moon trails shot with warming flash shot; G: Post blend cleanup; H: Post it here! I actually almost posted a whole different version that shows more of one still, see below in comments.